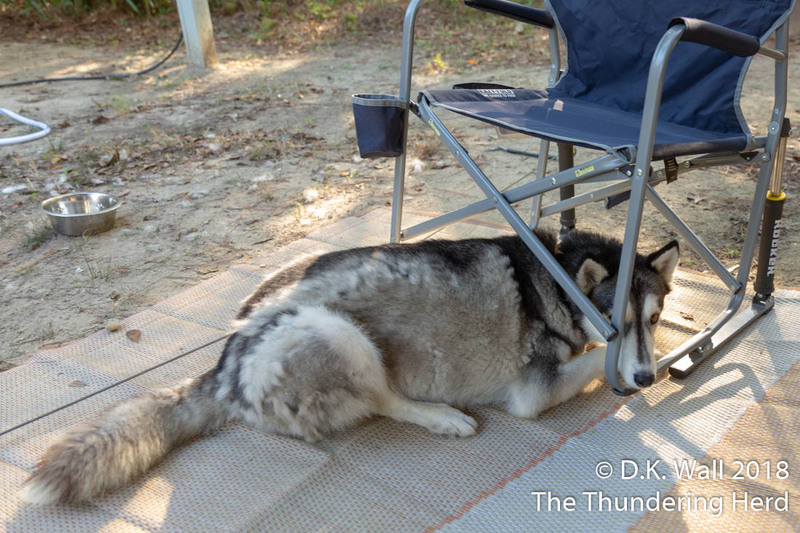 You may think that a simple RV trip wouldn’t require a lot of complicated situations, but we have photographic proof of camping equipment malfunction. What do you mean a rocking chair is not for shade? Some of you may not be able to look past the fact that Typhoon is blowing coat this week. He likes to do things in the most noticeable way possible, so dropping tufts of hair everywhere works really well on our trip. Since he screams if touched by a brush, he will continue to look this bad for several days. And, of course, there is the slight problem of him using a rocking chair in the wrong way. But that doesn’t come close to someone who fails to understand the concept of a water bowl. What a comfortable spot for my paw. 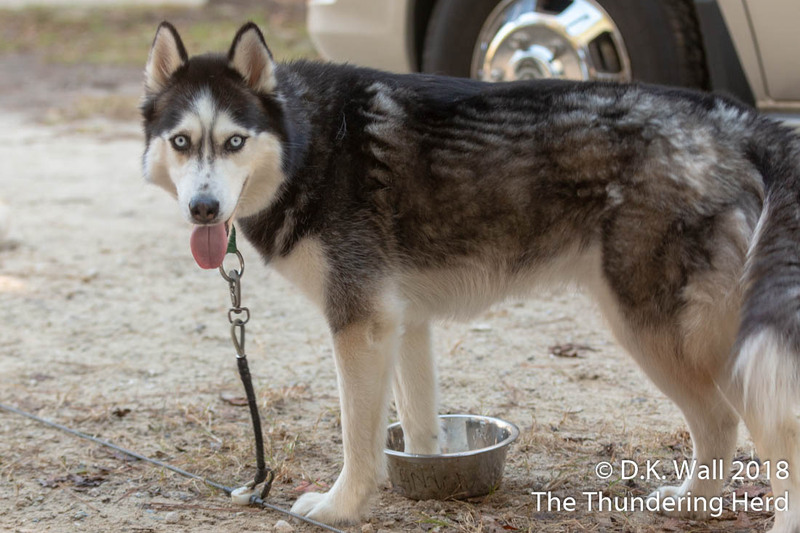 Yes, Landon is watching others go by the campsite while standing in his water bowl. Just in case you think this was a total accident and Hu-Dad just happened to catch this on camera, we present you another example. Why, yes, I have switched which paw is in the bowl. Oh boy Hu-Dad-it seems like LOADS of fun with the Herd on a camping trip!! 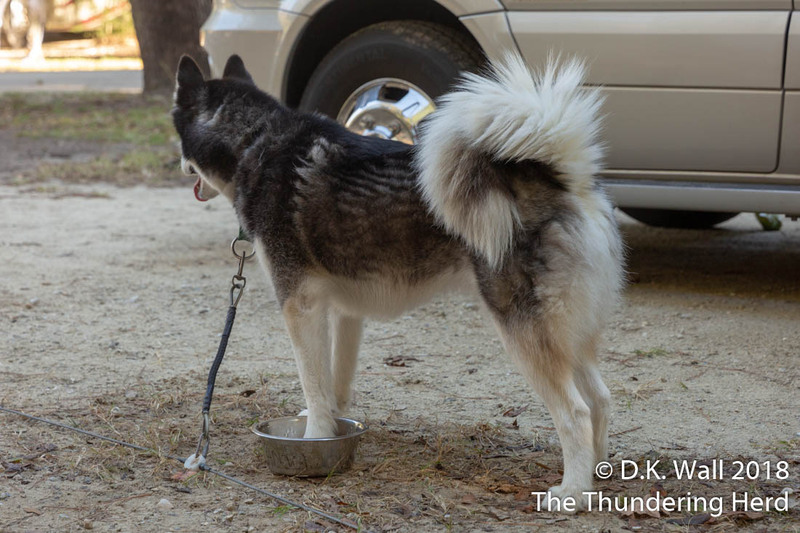 Landon using the water bowl to stand in and Typhoon Phooey blowing his coat and hair drifting into all types of things(like food). Especially since he doesn’t like the word “BRUSH”!!! Have fun! Does this paw look better covered with water or do you think this one does? Those dogs are a hoot. Can we get a video of Typhoon’s antics while being brushed? Just a few seconds? I certainly don’t want you to torture the poor boy! Oh, that could be good! We will have to rate it R for language (for anyone who speaks Sibe). LOLOL!!! just when I needed this. like magic. it appears. foot. feet in water bowl. he’s dumb like a fox that boy is! and he makes me laugh out loud Hu Dad! One of my German Shepherds does the “paw in bowl” thing, but she just leaves it for a few seconds, then puts a nice wet paw print on the floor with a big grin on her face. ← Can We Have An Extra Walk?